Work on the climbing areas in the Northern Grampians is due to start very soon which means that getting access to them to climb is just around the corner. Well, around the Winter corner anyway. The latest update is that there is some positive progress with the Rock Climbing areas in the Northern Grampians. PV have contractors scheduled to begin works within the Amphitheatre in the next few weeks, with the view to hopefully have the Stapylton Amphitheatre opened by the September School holidays. Summer Day Valley will also have contractors beginning works in the next few days, with the view to have works completed by the end of winter. At both sites, the contractors will be undertaking short sections of track realignment and stabilisation works. As part of this project Parks will be looking at creating directional signage for the area so that climbing sites are identified at the trail heads (Mt Zero car park, the entry to the Amphitheatre and Hollow Mountain Carpark), and at the site turnoffs on the main walking track. CliffCare and the climbing community’s involvement will be required at some stage and once some work projects are organized, I will start putting the word out.More than likely there will be some work days planned for August. In other news a working bee has been organised for the Queens Birthday long weekend. at Mt Arapiles. This will be to continue work on the Pharos Gully Track. Walter our stonemason is nearing the end of his pile of rocks near his work area, so it’s up to us to get some more up there. Working bee will be on from 3 until 5 on Saturday 7th June. It would be great to get some more bodies helping out. Drop me a line at cliffcare@vicclimb.org.au Otherwise if you are in the area, go to the bottom end of the Pharos Track – up the track to where it starts to get steeper. Resident slavedriver Cameron, will be there directing able bodies to the chosen rock pile. Half an hour is all that is expected. The Banff film festival is also just around the corner. CliffCare runs the bar and this is one of the major fundraisers we undertake. If you think you may be able to help out on the bar, please drop me a line cliffcare@vicclimb.org.au I am looking for a few more volunteers for the Saturday matinee and evening shifts. 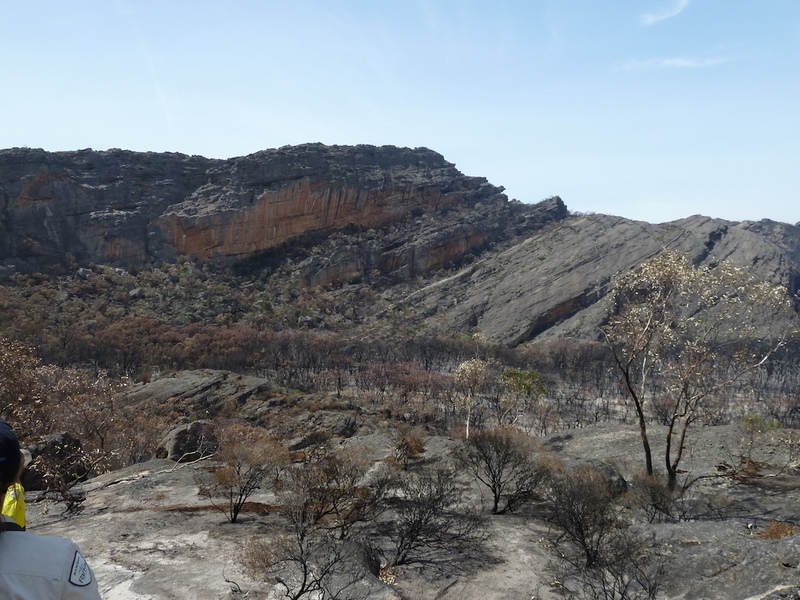 This entry was posted in Access &Environment officer reports, Arapiles, Grampians, Parks Victoria updates & info and tagged access report, Bushfires, closures, grampians, hollow mountain, mt stapylton, parks victoria, taipan by Tracey. Bookmark the permalink.